President Salva Kiir (l) did not sign the deal, despite a deadline and the threat of sanctions. South Sudan’s President Salva Kiir has failed to sign a peace deal in Ethiopia’s capital Addis Ababa, aimed at ending the civil war in his country. The government has initialled a draft agreement, but requested a further 15 days before signing in full. International sanctions had been threatened by mediators if both sides failed to reach an agreement on Monday. Tens of thousands have died and more than two million have been displaced since fighting broke out in 2013. 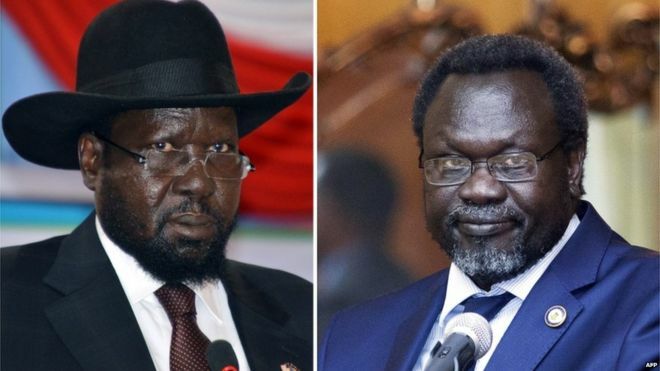 Rebel leader Riek Machar, who did sign the deal, said he had expected more concessions from Mr Kiir, and did not know beforehand that the South Sudanese president would fail to sign it. President Kiir’s team had “reservations” over the deal and wanted 15 days for “consultations” before returning to sign it, Seyoum Mesfin, mediator for the regional group Igad, told the media. Mr Mesfin decribed it as “a great day in the forward movement of the peace process in South Sudan”, despite noting that the signing of the deal was “not complete”. Tobias Ellwood, a British Foreign Office minister at the talks, said now was not the time to celebrate. The contents of the deal are not yet clear, but there was disagreement about power-sharing in a transitional government. 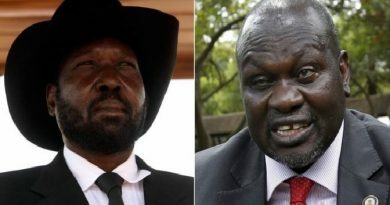 Alongside Mr Machar, the deal was also signed by Pagan Amum, a senior South Sudanese politician who is representing other significant political figures accused of involvement in the alleged coup. Mr Amum was recently reinstated as secretary general of the ruling SPLM. Several previous ceasefire agreements have failed to hold. South Sudan is the world’s youngest country, having gained independence from neighbouring Sudan four years ago. The leaders of Uganda, Kenya and Ethiopia were also at the summit, as part of an international peace-building effort which includes the US, UK, EU, Norway, China, the African Union and the UN. “A peace that cannot be sustained cannot be signed,” Mr Kiir said on Sunday. In July, a UN report alleged that government troops had gang-raped and burned alive women and girls in the oil-rich Unity State, during an offensive against rebel forces. The rebels have also been accused of carrying out widespread atrocities, killing civilians in attacks on mosques and hospitals. The conflict erupted in December 2013 after Mr Kiir accused Mr Machar, his sacked deputy, of plotting a coup. Mr Machar denied the allegation, but then formed a rebel army. Much of the fighting has been carried out along ethnic lines, between Mr Machar’s Nuer group and Mr Kiir’s fellow Dinka, the two dominant ethnic groups in South Sudan.